Please enter your account details to log in to your user account. Please write a valid email address. Didn’t get a reset link? Wait 15 minutes before trying again, as some requests are slow to process. That’s ok - enter the email address linked to your Catchys account. If you’re in our system, we’ll send you a reset link. A shoe known worldwide under its own name? We can imagine “Chuck Taylor” – nicknamed “Chucks”. Everyone knows them and many of us love the comfortable sneakers from Converse . The trend shoe from Converse was already designed in 1923 and originally developed as a basketball shoe. Since then, the legendary shoes have reached worldwide cult status and have now sold nearly a billion times. Already stars like James Dean or Elvis wore the trendy Chucks in their time and even today the hype around the sporty shoe is unbroken. Converse All Star are the perfect shoes for leisure. Whether you combine your Converse shoes casual with jeans or wear a sweet mini dress with floral print: the original Chuck Taylor fits almost every look. The famous shoes of Converse. is available in two versions, as Low or High Top model. Depending on the variant one can at different places an original Converse. Shoe different from a fake. To ensure you are well prepared when purchasing your new Converse Sneakers and know what you need to look out for, you can find the most important features of the original Converse in our Fake Check. All Stars. As always, the at least features can be seen alone as an exclusion criterion. In most cases, the interplay of factors is important. If you’re still reading the original Converse in the hands of your Fake Guide, be sure to keep your fingers out. It could be a fake! The most important features of the High Top Chucks are clearly the logo patch on the inside of the shoe. If you find a shoe that has the logo on the outside of the shoe, it is 100% a fake model and can be used as an exclusion criterion. An original Converse shoe has the round logo patch always on the inside of the shoe. The patch itself consists of a thin, round rubber layer. The circle of an original Converse shoe is exactly 4.6 cm in diameter. The patches of fakes are usually slightly smaller. On the logo patch are the letters “Converse All Star” in uppercase letters as well as the name of the model “Chuck Taylor”. In the center is a five-pointed star, which is the typical Converse look. 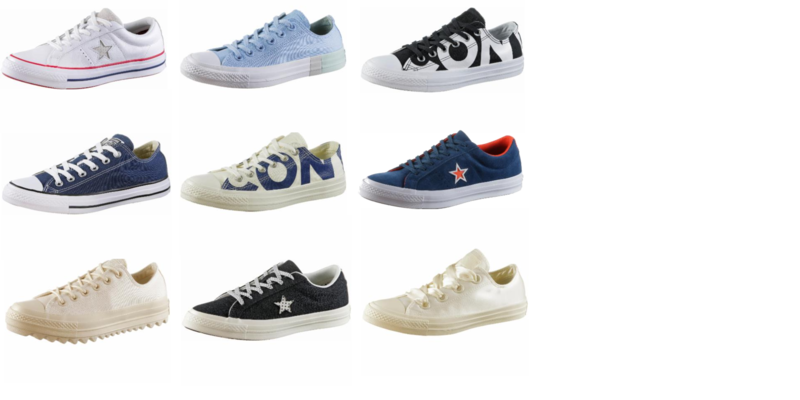 With an original Converse, the logo is placed centrally on the rubber patch and can not be detached from the fabric of the shoe, even when rubbing or kinking hard. The logo of Fake Converse shoes is often out of focus, not color, the color can be blurred or the font differs from the original. In addition, the logo is often found on the logo of Fake Converse shoes. It is the trademark for a registered trademark. Original Chucks have not integrated the “R” since 2008 in their logo! Second hand, however, you can still get a vintage Converse model, which is branded with the old logo. Then the logo on your high top chucks also contains the ® symbol. All original models, which were produced after 2008, have certainly not integrated the “R” into the logo. So look up! Low Top Chucks have, in contrast to the High Top models on the inside no logo. Here you have to switch to other recognition features. In order to use the shoe tongue in an original Converse shoe as a recognition feature, it is of relevance whether it is a low or high top model. For every Low Top model, the Converse All Star logo has the tongue on the tongue – but not on the high top models. Traditionally, this is a thin, rectangular canvas fabric sewn onto the shoe tongue. However, there are also original Converse models, which are only a print. Whether sewn or printed: the logo should be clearly recognizable. A fuzzy writing or a bad processing of the seams should make you immediately stupid. It could be a fake. Whether low or high top: the tab contains a small patch on the inside, which contains information like the Country of manufacture, the model number and the shoe size. Also the sole of the original Converse provides you some identification features for authentication. Inner sole: The inscription “Converse” is printed in capital letters in the inner sole of each chuck. As with all other logos, the print should also be clear and clear. With vintage models, this can be worn off by wear, of course, and does not have to mean a fake. However, all Converse sneakers should be the brand name on the inside sole. Outsole: On the outsole, you can also hide whether you are dealing with an original or fake. So check it out, if you can spot conspicuousness. For every Original Converse shoe you will find a small part on the outer sole, which incorporates the Converse logo. Here you should again find the lettering “Converse All Star” in uppercase letters as well as a five-pointed star. In addition, you will be able to discover a very small, hexagonal star in the corner. This note is almost always missing in fake models. For a long time the decorative seam on the white sole was considered the distinguishing feature of the original Converse sneaker. Since Converse in the year 2015 however the “Chuck Taylor 2” on the market has brought, in the search for Fake indicators can no longer rash reference to the ornamental seam. The new models of the “Chuck Taylor 2” are equipped with a completely white sole – without a decorative seam. The original design of the Chucks is still available and has not been changed. The classic Chuck Taylor are therefore still provided with the distinctive decorative seam which can vary depending on the model in the color. In principle, the seam should be processed clean and separate the sole just in the middle. Wobbly lines or unclean seams make a bad processing and thus a fake close. On most vintage models you can buy second hand, it is the original design of Chuck Taylor. Therefore you should not neglect the decorative seam and use it as an authentication feature. All Converse Chuck Taylor sneakers are fitted with a rubber patch on the heel. The patch is rectangular and is branded “Converse All Star”. Depending on the model, the font can be black or white. If you can not find a logo lettering on the heel in the Converse shoes of your choice, then leave your fingers off the offer! You can have a fake in your hands. The classic Chuck Taylor from Converse in the plain, one-color version as low top model about 65 € and as high top model 70 €. Special patterns or special editions can obviously cost much more. Here there are genuine collectors’ items which are also much more valuable. If a dealer offers new-quality Converse sneakers for significantly less money, you should be generally stutzig. It could be quite a fake. If you love second hand shopping, however, you can hope for much lower prices and still get an original. At Catchys, you’ll find the trendy Converse sneakers starting at 25 €. The Converse sneakers are among the most famous shoes worldwide and are bought every year by countless fashion lovers. No wonder there are a lot of fakes on the market and hope for good faith buyers. Caution is offered by online merchants on portals like Ebay & Co. Here are offered original Converse shoes from just a few Euros. Be careful! Fortunately, there are now enough trusted salespeople to buy the original Converse. In the official German shop of Converse you will find the cool models in all versions and of course also the latest special editions. You can also get your Converse from certified traders like Planet Sports or Kickz Buy shoes with peace of mind. But if you’re looking for a popular vintage model, it’s worth it! On Catchys you can get the trend shoes from Converse from the Second Season. There could be some or other sought after collectors waiting for you! You’ve made it to the end of this fake guide for Converse shoes? Very good! Then you are now well prepared and know what you should pay attention to when buying your new Converse. Whether you’re looking for new or vintage chucks, with the right eye for the important details, you’ll be able to easily distinguish a fake from the original Converse . What are you waiting for? It’s time you broadened your personal Chucks collection by at least one new pair. We hope you enjoy shopping! Louis Vuitton Neverfull: MM or GM?